The rise of social media as a mainstay in our daily lives has also brought about the rise of a whole new career opportunity: the social media influencer. The size of your social media following can give you enough clout for companies to take notice and choose to work with you to promote their products and services. 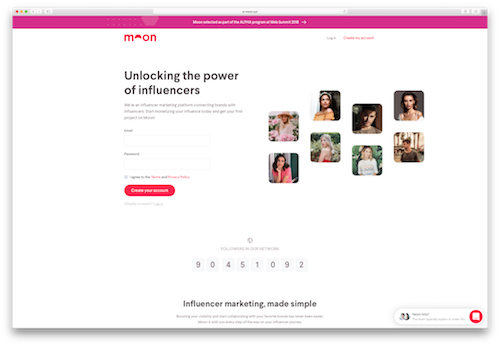 This week’s #WebsiteWednesday, Moon.xyz, knows the influencer field better than anyone, and they have the tools to set your influencer marketing career up for success. Moon.xyz launched on September 19th, 2018 after months of buildup and teasers on their memorably branded social media pages (@GetMoonxyz on all platforms). Moon.xyz’s network of influencers now has an amassed total of over 200 million followers to their collective names, and that number is jumping higher and higher every time they welcome another influencer to the fold. The spectacularly successful rollout Moon.xyz has enjoyed can be attributed to the transparency and accessibility their platform provides for influencers. A one stop place to manage all social media profiles, real-time analytics detailing profile reach and potential interest, and simple tracking of ongoing conversations with brands are just a few of the tools influencers on Moon.xyz’s platform can wield to leverage their following into brand partnerships. Of course, you don’t create a hot new business like Moon.xyz without garnering a little buzz, so it’s no surprise that Moon.xyz was selected to participate in the ALPHA program at Web Summit 2019, which took place earlier this month in Lisbon. At the event, which has been called “the best technology conference on the planet” by Forbes, Moon.xyz had the opportunity to pitch a potential investment to some of tech’s most influential founders and investors. “We’re on a mission to make the influencer industry more transparent — by allowing creators to publicly share their rates — and more accessible to brands. We also want more brands to tap into this booming industry, and to realize that no matter their industry or size, there is an influencer for them. Every day, we are inspired by the motivation, drive and ambition of our influencers. It took them years building an audience before being able to monetize it. They are shooting for the Moon, and we’re here to help them at every step of the way. After getting their business off to a great start, Moon.xyz has poised their company to expand and evolve to meet the needs of influencers who trust their platform, and their .xyz domain is ready to follow right along with them on this exciting journey they’ve embarked on. Next Post » Shake off the turkey slumber with eye-openingly low deals on .XYZ domains!